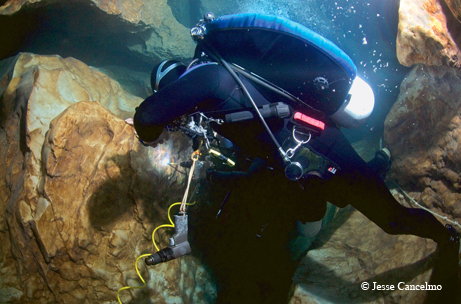 ﻿﻿﻿The nation’s deepest known underwater cave system lures expert divers. ﻿﻿﻿Positioned on the choppy surface of Lake Amistad, at 29° 32.21’ N, 101° 15.18’ W in Val Verde County, a simple white and blue buoy marks the location of a geographic feature few will ever see. The mouth to Goodenough Spring lies some 165 feet below the reservoir’s normal pool level, beckoning the way to an environment so harsh that most divers — even the highly experienced — turn back. ﻿But not all. 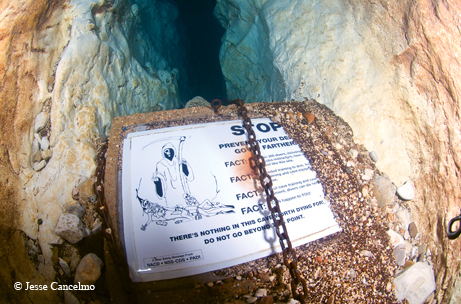 For the past decade, the seasoned diver-explorers of the Goodenough Springs Exploration Project (GSEP) have been plumbing its secrets, gradually advancing farther and deeper into the United States’ deepest known underwater cave system. The system, which emerges from the Salmon Peak layer of Southwest Texas’ Edwardian limestone, possesses both faulting and erosion channel features. “It’s a unique geology,” says Chuck Noe, the project’s director. Before Amistad Dam’s 1968 completion submerged 65,000 acres of desert beneath waters from the Rio Grande, Pecos and Devils rivers, Goodenough Spring flowed at the surface, a welcome resource in an arid land. Situated 12 miles northwest of Del Rio, it discharged an impressive 100-200 cubic feet of water per second under artesian pressure, making it Texas’ third-largest spring. With the sprawling new lake, the spring became obscured, and the lake became a recreational destination, drawing boaters, fishermen and sport divers. In the earliest years, most nonprofessional divers limited themselves to depths of 130 feet because of decompression and nitrogen intoxication issues, so the spring remained largely out of reach. During the 1980s, the scuba community turned increasing attention to deeper, more complex dives, adopting advanced techniques previously reserved for elite Navy and commercial divers. In particular, the use of gas mixtures like trimix (oxygen, helium, nitrogen) allowed them to dive deeper and stay longer. By the early 1990s, divers trained in mixed-gas use — known as technical divers — had routine access to the cave. R.D. Milhollin of Dallas was among those who explored the area during that period. He and his companions — Ise Kalsi, Terry Scoggins and, later, Robert Laird — reached the cave’s main passage, where a torrent of fast-rushing water greeted them. They set out to conquer a 90-foot-long section of tunnel, known today as the Fire Hydrant, using mountain climbing gear. Wedging chocks tightly into available cracks in the ceiling, they tied climbing rope to them and climbed horizontally, upside down, against the fierce flow. That wasn’t their only approach: On one memorable occasion, Milhollin and Laird proceeded through a combination of maneuvers that included successively tossing and anchoring a length of heavy pig iron pipe, a few inches at a time, along the gravel floor. Their efforts ended at a point, 200 feet deep under normal pool conditions, where piled-up gravel blocked most of the tunnel, preventing further access. Milhollin’s team ceased its explorations around 1995. Laird continued to visit the cave, and in 2000 he stepped up his involvement when a group of Houston-area divers asked him to help them locate the spring. His interest rekindled, he joined with them in launching GSEP to explore the site systematically. The spring’s challenges are in fact monumental. In addition to its great depth, enormous flow and the often-poor visibility of the surrounding lake water, a steep gradient between the spring’s year-round 81-degree water and ambient lake temperatures as low as 55 to 60 degrees in winter severely limits cold weather diving activity. GSEP’s 11-year history unfolds as one of tireless work and steady, gradual progress punctuated by dramatic breakthroughs. The “Goodenoughers” devoted earlier efforts to such basics as the installation and maintenance of sturdy chain moorings and tough, knotted nylon guide lines in the previously explored areas. Only in 2002 did they make their first coordinated effort to get past the gravel barrier by digging gravel away to enlarge the opening. Their excavations eventually yielded a hole barely large enough for Noe, the smallest team member, to squeeze through into the unknown. “My heart was pounding,” admits Noe, who returned quickly after installing a steel piton in a wall crack to extend the guide line to the other side. On a second brief trip the next day — still alone — he glimpsed a steeply dropping passage: one hint (along with the warm temperature) of the cave’s great depth potential. But it would be more than a year before anyone followed him beyond the gravel dam. In the summer of 2003, nature intervened to accomplish what long hours of laborious excavation had not. Waters stirred by Hurricane Claudette’s landfall on the South Texas coast, roaring through the spring system, blew most of the gravel away. Since then, GSEP divers have explored deeper into the cave in the course of several trips each year between May and October, ultimately achieving a depth of 515 feet. They added a scientific dimension to their mission in 2005 when water scientist Ray Kamps, then a Texas State University doctoral student, sought their assistance. Kamps, who was conducting federally sanctioned limnology research at Lake Amistad, needed divers to deploy instrumentation to measure water temperature and salinity at the spring. It proved a fortuitous collaboration. Exploration and science have worked hand in hand ever since. GSEP has expanded its research role, taking on projects in connection with the Texas Water Development Board and the U.S. Geological Service, and publishing an article on the chemistry of Good­enough Spring in the peer-reviewed Hydrogeology Journal. They also pay for their own independent studies, like their ongoing effort to delineate the spring’s catchment area. Kamps, who soon joined GSEP as its scientist of record, believes the catchment is a large semicircle around the spring. Time differences between the spikes increase with distance from the rain source. He then matches his readings to radar weather maps in an effort to identify which thundershower produced a given spike or spikes. Though the work is far from complete even after four years, results to date suggest that the catchment area is a wide swath of plateau land located on both sides of the border: north, sweeping west and ending south of the spring, with the biggest response from the west. Exploration — safely advancing members’ individual goals in a context of close teamwork — remains the heart of the enterprise. 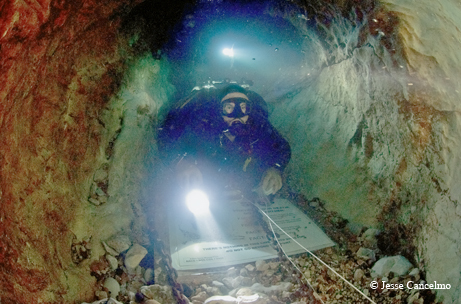 In 2009, GSEP received the National Speleological Society Cave Diving Section’s coveted Exploration Award for achieving the deepest cave dive ever documented in the United States. “When we started this project, we didn’t even know that the cave went deeper than 100 feet. We just wanted to explore it,” says Noe, who, with extensive logistics support from six other Goodenoughers, descended to a record-breaking depth of 515 feet. Staging for each trip is a highly complex production. 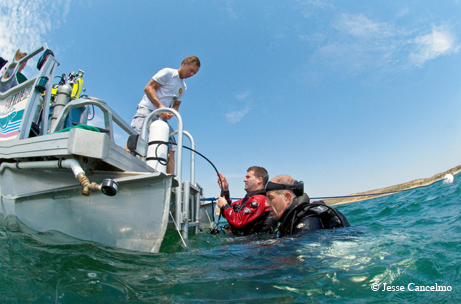 A typical expedition finds GSEP’s two dive boats fully loaded with several tons of equipment: tanks of varying gas mixtures, wetsuits and other personal gear, maintenance supplies and scientific instruments — plus the seven or eight divers (about half the current active membership) themselves. Depending on need, they might also haul such specialty items as a wetsuit-heating unit Noe himself constructed for dives deeper than 250 feet at chilly temperatures. The redundancy of tanks and the heating equipment are necessary for decompression issues. During a typical deep dive, nitrogen dissolves in the bloodstream — nitrogen that must be released very gradually on ascent if the diver is to avoid a life-threatening pressure illness known as the bends. Ascending divers make multiple progressively longer decompression stops at progressively shallower levels. They also change tanks twice along the way (to a 50-50 oxygen/nitrogen mix at 70 feet and pure oxygen at 20 feet), clipping on new gas cylinders that setup crew have previously tethered to the mooring chain in the appropriate spot. The longest decompression stop — sometimes lasting several hours — occurs at the 20-foot level where, in cold weather, hot water pumped through a hose from Noe’s propane-fired Deco Heater on deck makes the wait more comfortable. When the lake is at normal pool level, a Goodenough Spring dive begins with a 150-foot descent to an amphitheater-like area. Fifteen feet farther down, GSEP’s Grim Reaper sign, installed to warn the unwary away, marks the cave’s entrance: a 6-foot-wide fissure that quickly opens into a round, high-ceilinged room called the Well. To the left, a trip through the formidable, scalloped Fire Hydrant tunnel and past the former gravel restriction reveals a geography of sharp, deep drops and winding switchbacks; of mud and boulders and gravel-filled pit bottoms; and clay walls deeply fluted (possibly from the action of churning gravel during storms). And no end in sight. Will they push on to 600 feet? Indeed, nature has been merciless since Hurricane Alex ripped the Texas coast in June 2010. GSEP’s expedition in October of that year found guide lines ripped out, scientific instruments damaged or gone and a flow so high that divers were unable to proceed past the Well. Last May’s group encountered conditions nearly as extreme, though they were able to proceed several feet into the Fire Hydrant to set new instruments. But repair and maintenance, planning and, sometimes, waiting are all part of the game. The next major push — when it comes — will make use of scooters: neutrally buoyant, battery-powered, propeller-driven propulsion units that can pull divers along at more than 200 feet per minute under ideal conditions. Divers swimming hard at that depth require the mechanical assistance to avoid joint injuries caused by gas buildup in their tissues. “I’ll leave that to the younger guys,” says Noe, who’s 52. Should they ever descend 800 feet or deeper, they’ll need to adopt rebreathers — a completely different and highly sophisticated breathing technology that recycles used air. But they don’t think the cave will turn out to be that deep. In any case, the Goodenoughers have plenty to look forward to in the way of future exploration, science and maintenance. Though they also dive at Jacob’s Well in Wimberley, Goodenough Spring remains their first love. “We’ve sort of made it our project and our life,” Noe says. For more information on the exploration project, visit www.goodenoughsprings.org.